The Core i5-8265U brings just marginal performance benefits by up to 12 percent at best over the last generation Core i5-8250U or Core i7-8550U. Users who want the latest XPS 13 should be drawn in by the re-positioned webcam and not by the new Intel Whiskey Lake-U processors. We've completed our performance review on the XPS 13 9380 and results are as we expected. Much like what we discovered on the Asus ZenBook UX433, the Core i5-8265U Whiskey Lake-U CPU in the latest Dell Ultrabook offers no significant performance advantages over last year's Kaby Lake-R series. The gen-to-gen performance gains continue to be minimal at best. To show this, we ran CineBench R15 Multi-Thread in a loop on the XPS 13 9380 (i5-8265U), XPS 13 9370 (i7-8550U), and XPS 13 9370 (i5-8250U) with our results recorded below. The i5-8265U 9380 SKU is capable of higher Turbo Boost clock rates periodically for higher performance on average than even the Core i7-8550U. The delta, however, is so small that users will not notice the difference during day-to-day workloads. The i5-8265U can outperform the i7-8550U by about 12 percent when at its best, but performance is essentially identical between them when the CPU is at its worst. Nonetheless, users upgrading from the Kaby Lake XPS 13 9360 generation or older will still see a significant boost in multi-thread performance. 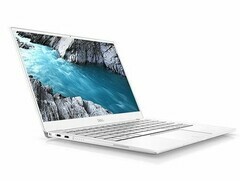 The XPS 13 9380 is notable for its re-positioned webcam when it was revealed at CES 2019. If you have no need for an immediate upgrade, however, then we suggest waiting until Q4 2019 when Dell will launch the XPS 13 with Intel Ice Lake and integrated AI features. Catch our full review on the XPS 13 9380 here.